If you’re searching for information about Kualanamu, my best bet is you’re already planning to visit Medan. So, I just want to tell you this: welcome to my hometown! 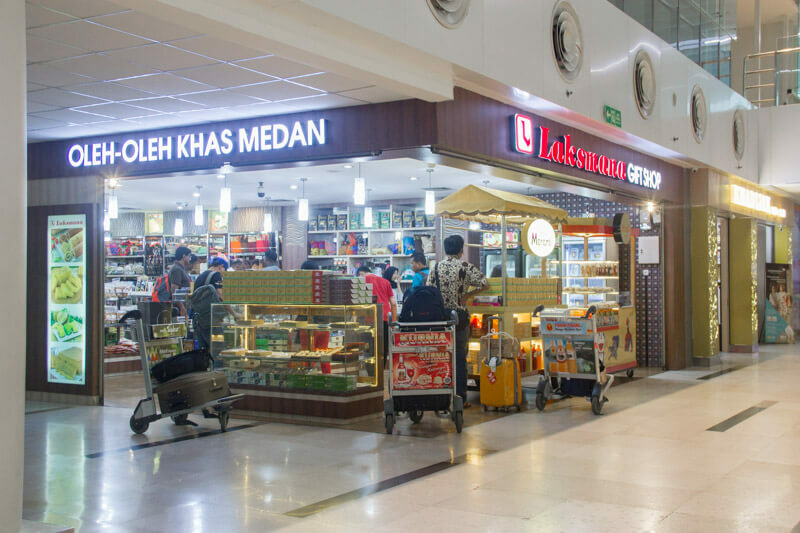 Here’s a little bit of introduction and history about Medan’s Airport. Before 2013, Medan’s old airport, Polonia, was located right at the heart of Medan. 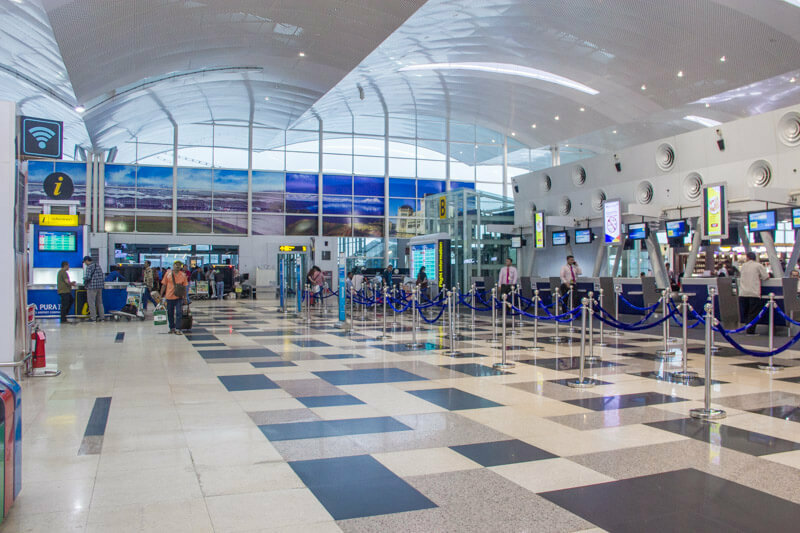 However, the old airport was too small to serve 7.5 million passengers annually (it was designed to handle 900k passengers only), hence the new airport. 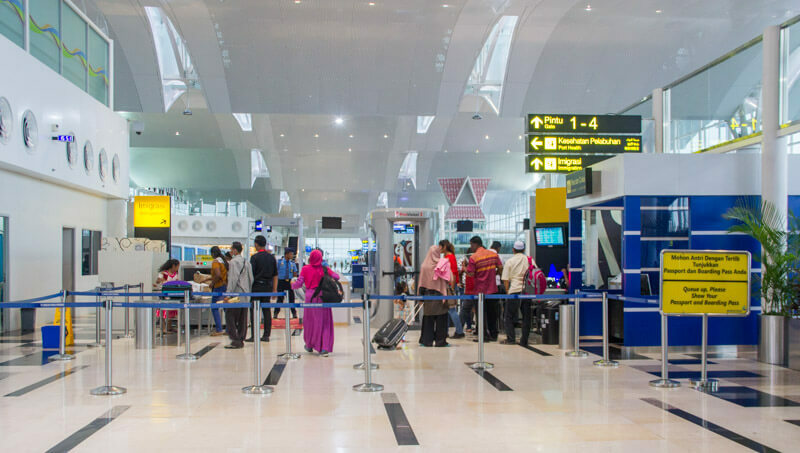 Kualanamu International Airport (KNO) was opened in 2013 and it’s located about 24km or 37km from Medan, depending on whether you take the toll or normal road. The normal road is about 24km but the road is narrow and traffic jam is common. 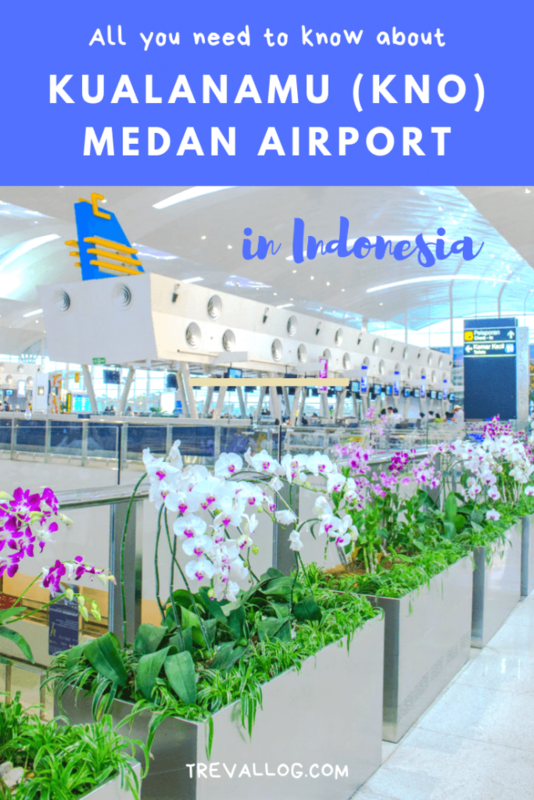 In this post, I’m going to write about facilities of the airport as well as travel tips from the perspective of someone who calls Medan her hometown. Most of the time, passengers arriving at KNO are able to walk directly into the building via the bridge. 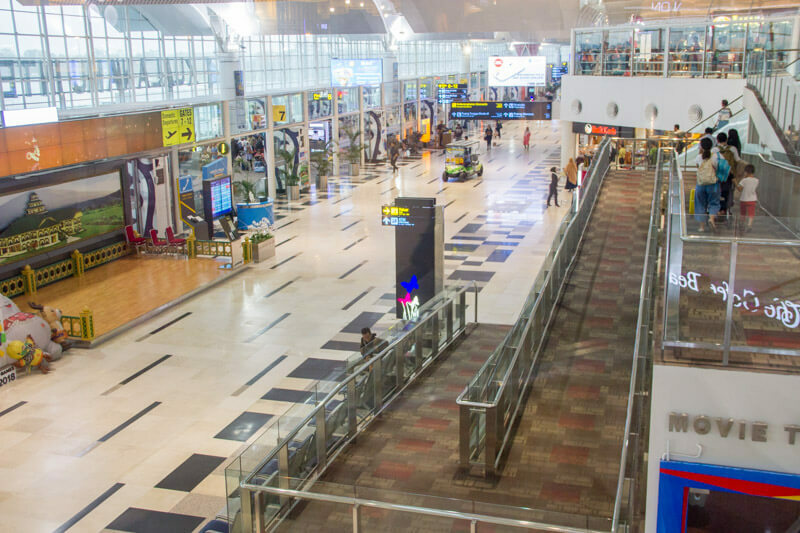 However, on rare occasion, passengers may be lucky to walk down the plane’s staircase and walk on the pavement to the arrival hall. From my personal experience, the immigration is never crowded. I always only spend maximum of 15 minutes. Locals and foreigners line up in the centralized line. No need to worry about line cutting or lining up at the wrong line. 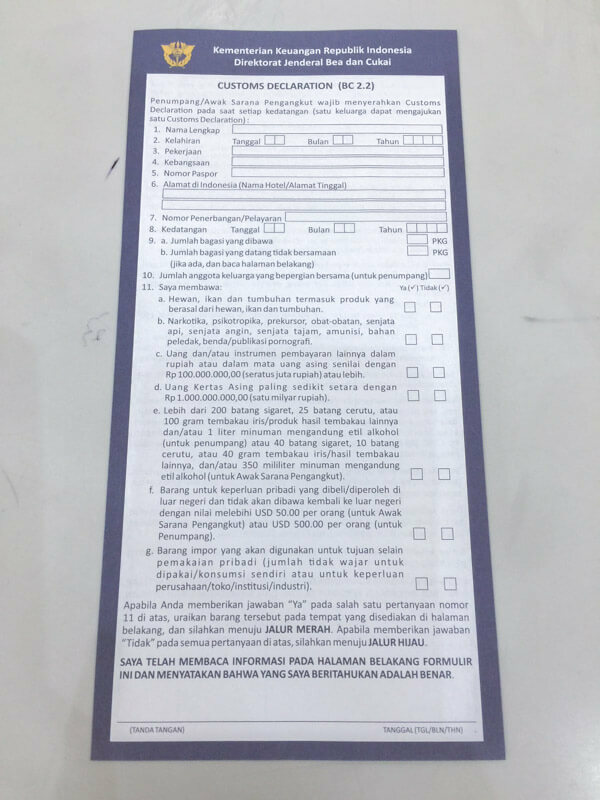 Indonesia no longer requires visitors to fill up immigration form, but they do require custom declaration (see the next point). 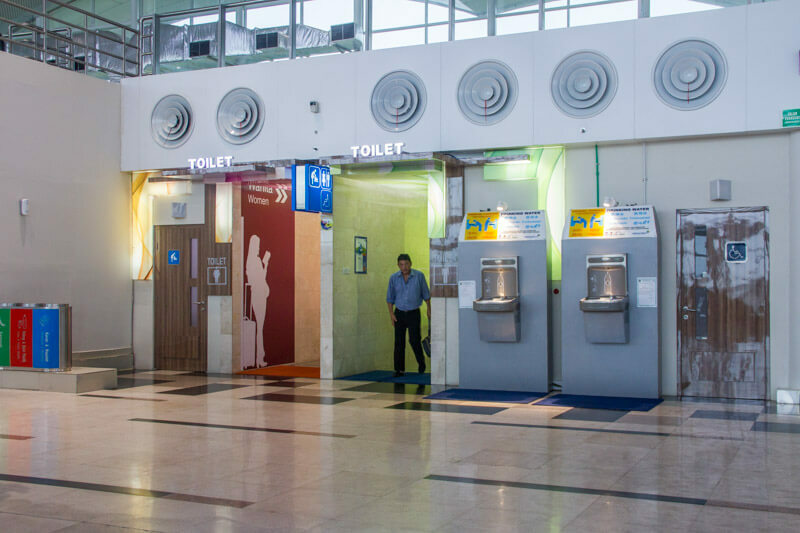 PS: If you need to go to toilet, the toilet before immigration a good place for incoming passengers because not many people use it so it’s quite clean. After immigration, it is the baggage claim. Look for your baggage and make sure you have filled up the custom declaration. Usually, airline crews would distribute the form on the plane. However, if you didn’t receive any forms, don’t panic. They’re also available at the baggage claim area. 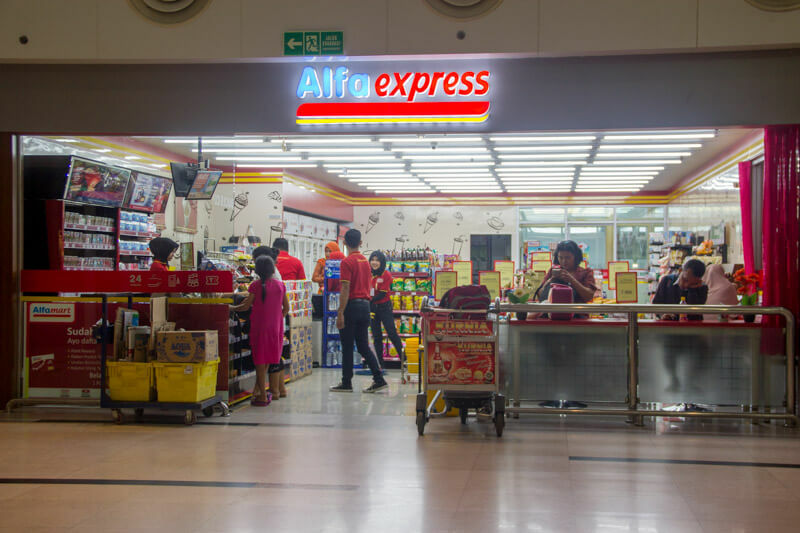 If you bring any of the item listed in no 11, you need to proceed to red line where you might be required to pay for tax. Read about custom requirement here (the website is bilingual, you can choose either English or Indonesia). PS: Don’t ever throw away your baggage tag that’s usually attached to your boarding pass. Officers may check your tag against the tag on your luggage. 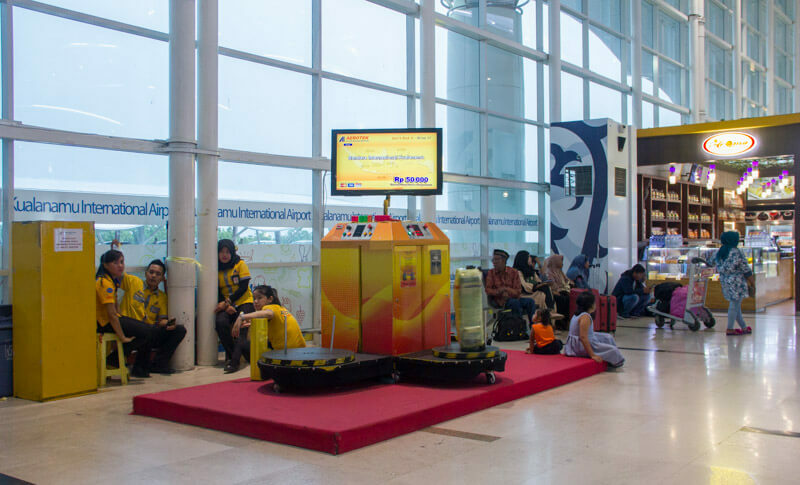 Once you have collected your baggage, submit the baggage form at the exit and then proceed to scan your baggage and exit to the arrival hall. 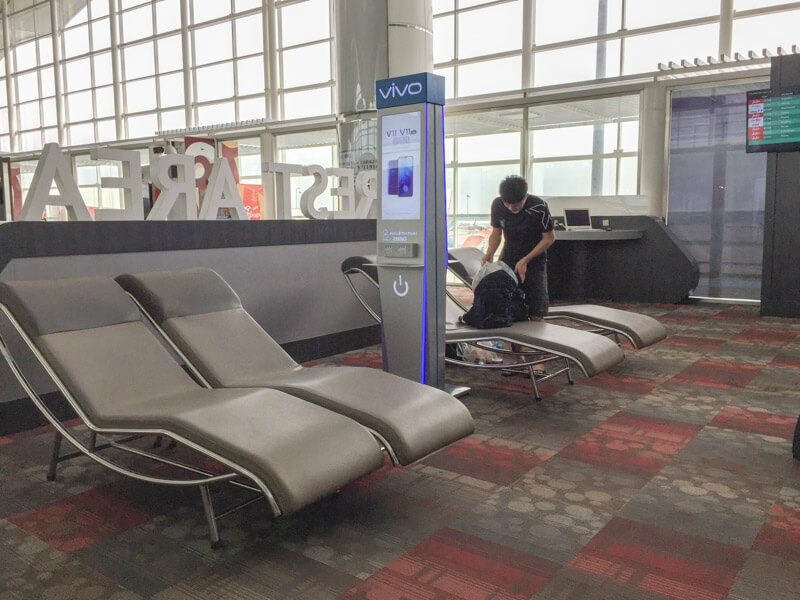 As with other major airports, KNO offers free wifi without having to sign up. The speed is pretty good. However, once you turn off your phone’s screen for several minutes, the connection drops. 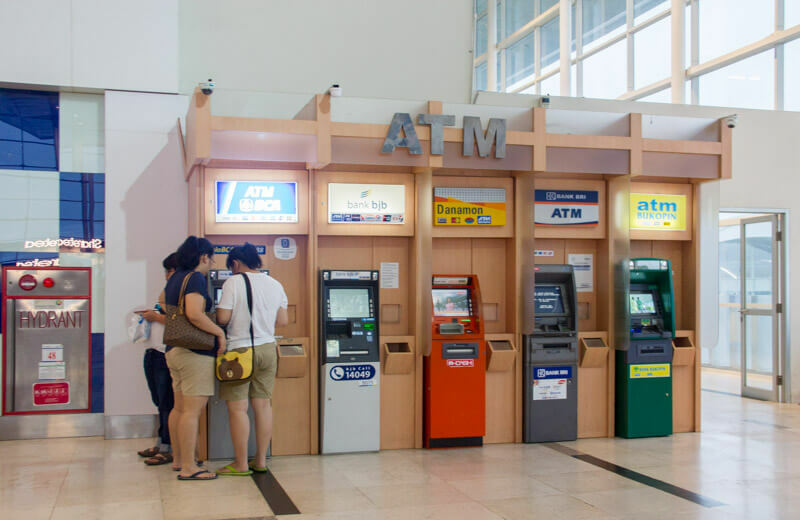 At the arrival hall (Level 1), you find change money at money changer, withdraw money from the ATM center, purchase sim card, purchase food from restaurant or convenience stores, or ask questions at the tourist information center. There are also left baggage and pharmacy at arrival hall. 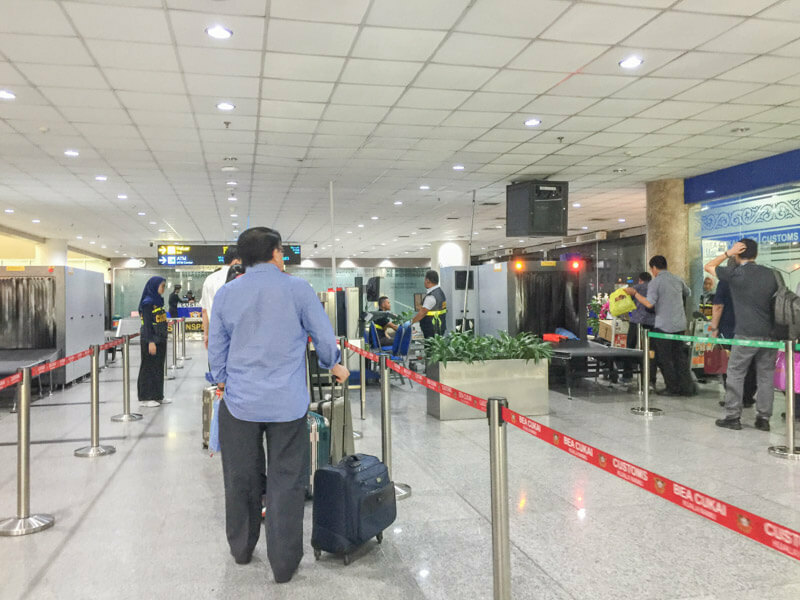 You need to scan your luggage, bags and everything you’re carrying at the entrance gate. At this gate, non-flying visitors are allowed to enter. No checking of boarding pass will be conducted. I guess it’s more like a general safety screening procedure. Now, it’s time for check-in! 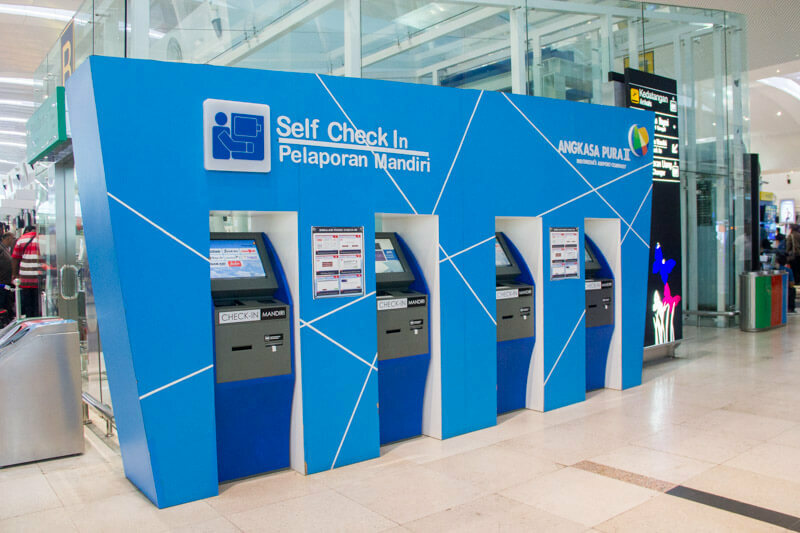 There are a couple of self check-in machines to speed things up. 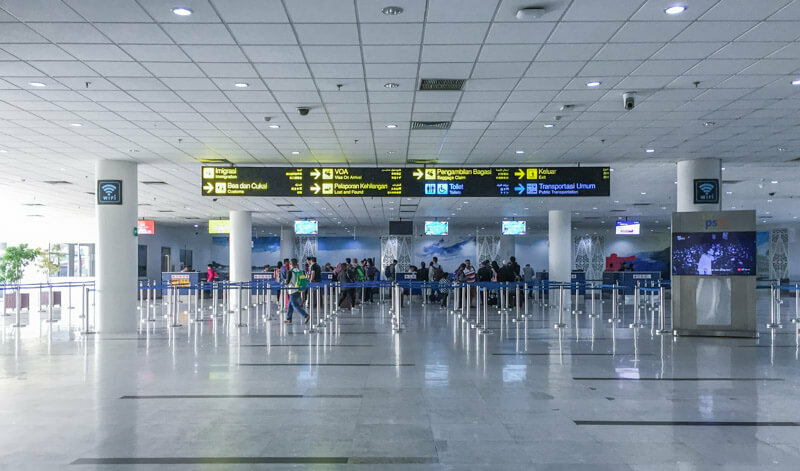 If you have luggage, it’s better to check-in at the counter. 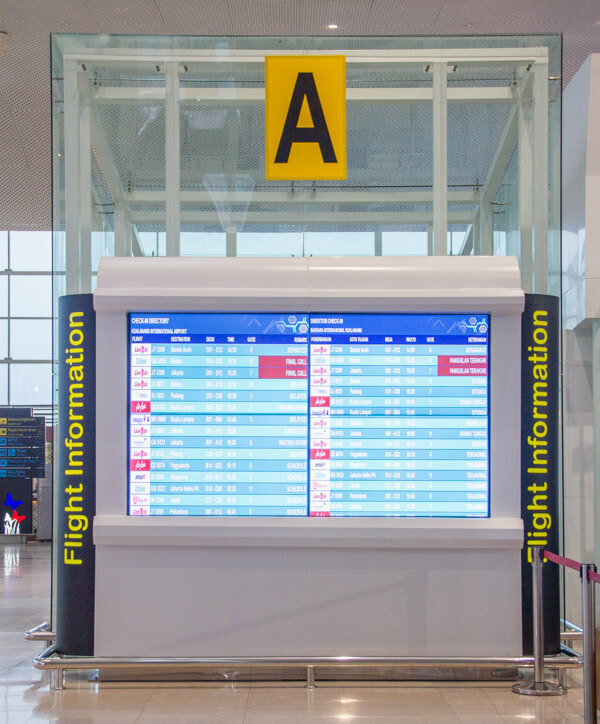 The flight info screen is rather hidden and could be easily missed out. At this moment, I presume that you’ve already done all of your souvenir shopping in the city where goods are cheaper and fresher. 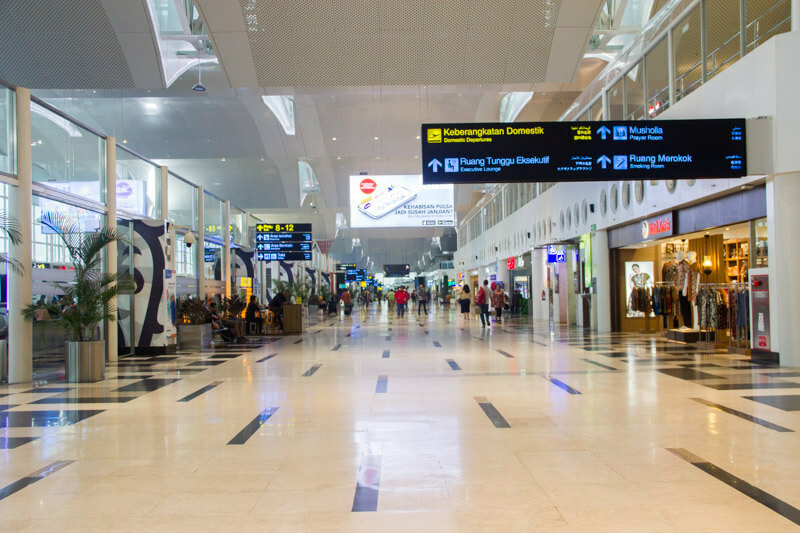 But… if you haven’t done enough shopping, you can do so at several souvenir shops at the airport. I’d recommend Bolu Meranti, Lapis Legit or Kue Ambon; all of which are cakes. 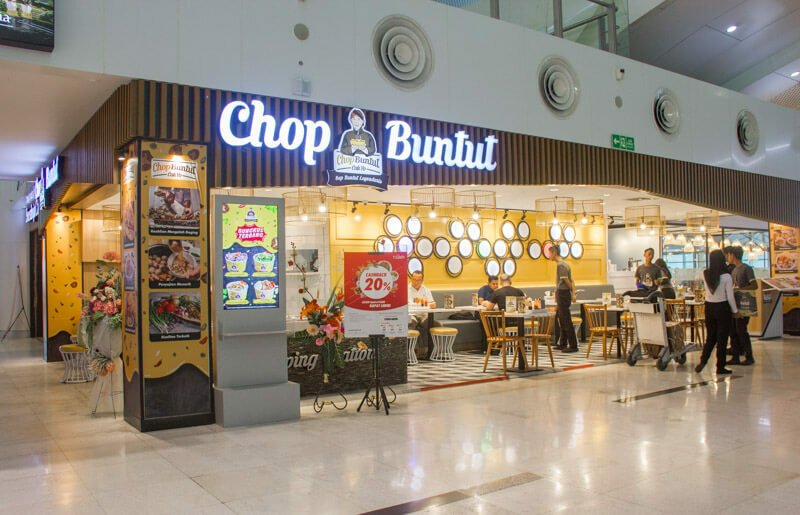 If you are hungry and you wish to eat something before your flight, you’ll be spoiled for choice. There are so many delicious local and international food. You can find several photos of restaurants in the “Food in KNO” section. So, you’re ready to fly. But, first, you need to go through a security screening at the Departure Gate. Here, non-flying people are not allowed to enter. After clearing the security screening, take the escalator or ramp down. On your right is the domestic departure hall. There are 2 lounges here, BRI and Sapphire Bluesky. At the end of the corridor, there’s a rest area and a kid zone that not many people know about. As for food, there are not many choices here. 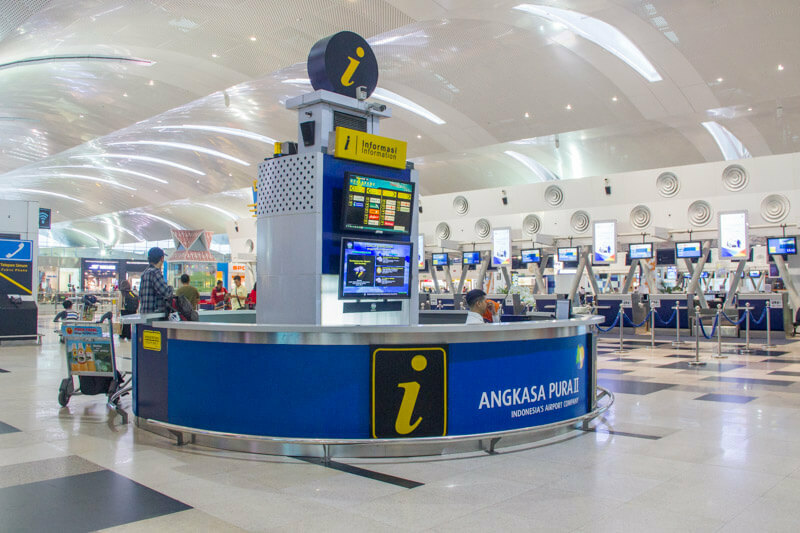 If you’re taking international flights, proceed to immigration located before gate 4. 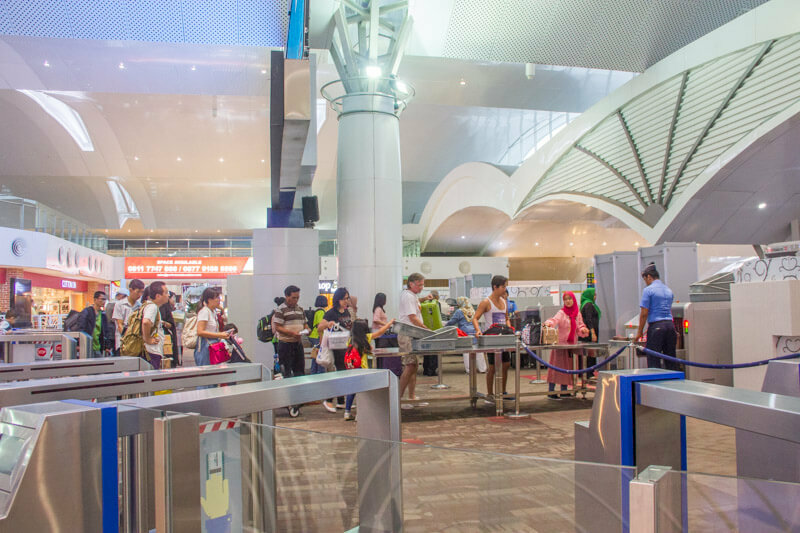 Here, there’s another security screening that you need to go through. Water is not allowed, but don’t throw your empty bottle yet, you can refill it after the immigration. Finally, you’ve arrived at the secluded part of the airport. Here, you can refill your water that the water cooler near the toilet. 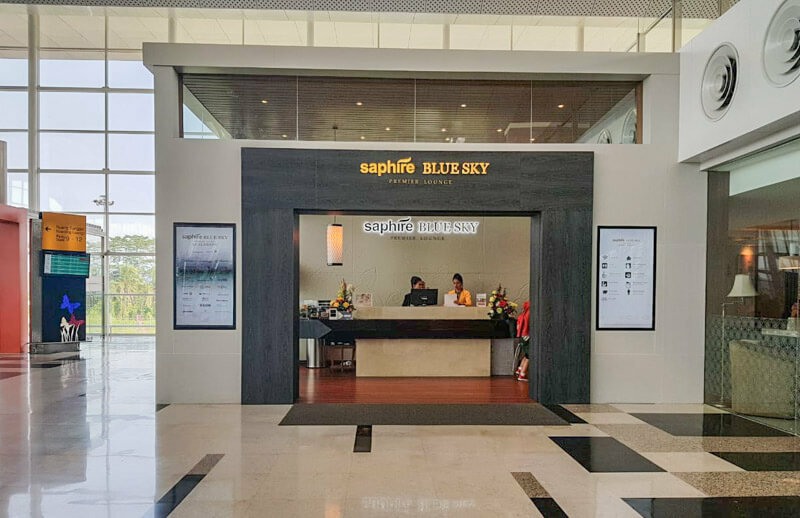 At the farthest end of the terminal is the Sapphire Mandai International Lounge. There are several shops here but nothing too fancy. This is the most popular method to travel between airport and Medan because it’s fast, safe, comfortable and not too expensive. It takes 35 to 55 mins from Airport to Medan (some trains have longer journey time as they cross path with other trains so they need to give way), and only 31 mins from Medan to Airport. It costs IDR 100k each way. Tickets can be purchased online in advance, or purchased over the counter. 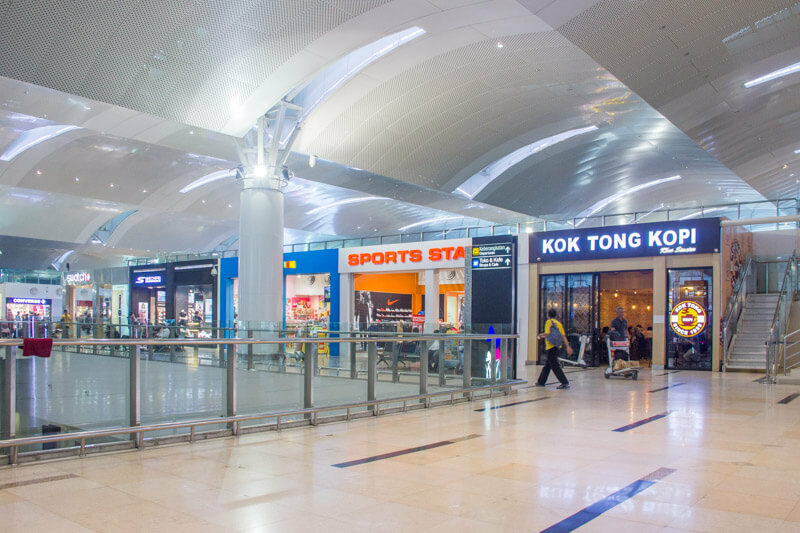 The train station at the airport is located just in front of the arrival gate (Level 1). It’s only 1 min walk from airport entrance to train station. Based on my experience, tickets are rarely sold out, so if you’re afraid that your inbound flight got delayed, you can buy after you come out from the airport. The train station in Medan (called “Medan Railway Station” in English, or “Stasiun Medan” in Bahasa Indonesia) is located at the heart of Medan. 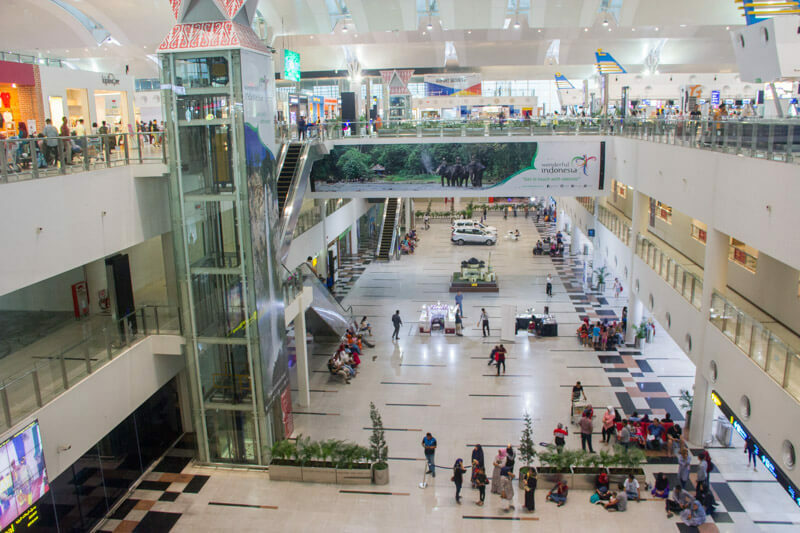 Centre Point Mall, one of the biggest malls in Medan, is just 5 min walk away from the train station. To go to your hotel, you can book a Grab/Gojek from the station or from Centre Point Mall. Taxi is almost non-existent nowadays. If you do spot a taxi, make sure you take Blue Bird Taxi because it’s the trusted brand in Indonesia. Railink airport train is my preferred transportation method when I’m traveling alone. However, if I’m traveling with my hubby, my preferred method is below. Private airport transfer is my family’s favorite transportation method between airport and Medan. Why? Firstly, it picks us up from airport and sends us directly to home. 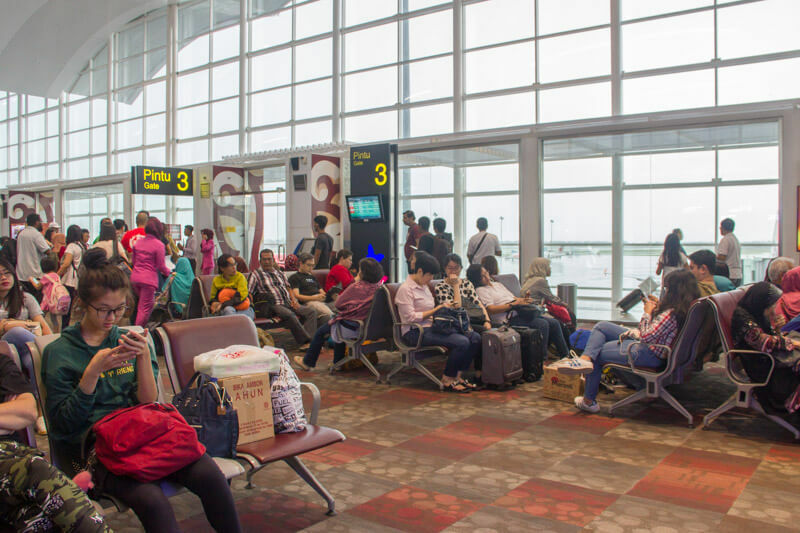 Generally, it takes 45 minutes to 1 hour to travel from airport to Medan by car, and vice versa. Secondly, it’s way cheaper than taking the train if there are at least two persons. Let’s compare. Two person taking the train = IDR 200k. From train station to hotel, it’s another at least IDR 20k. In total, it’s at least IDR 220k by train + taxi. A private airport transport costs between 180k to 250k (depends on the driver’s quote and car model). Taking the train means at least 35 mins train journey, maybe 15 mins waiting time prior to boarding, 15 mins coming out from train and getting into a taxi, maybe 15 mins taxi journey. In total, it’s about 80 mins just to get from airport to Medan by train + taxi. My family and I usually spend 45 to 60 mins between airport and home. Less than 200k for a direct transfer sounds like a better deal for us. If you are keen with this method to get to Medan city from the airport, I can assist you to arrange a private transfer with local drivers. 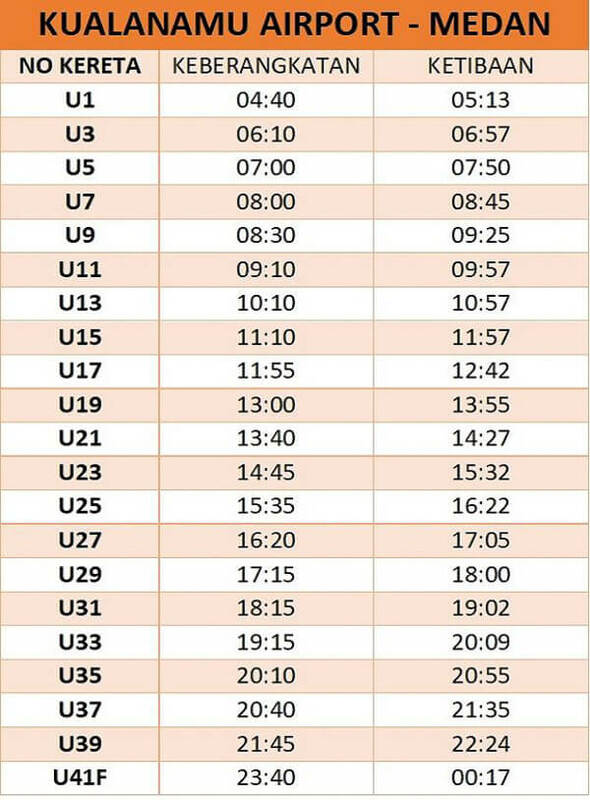 Taking public bus from airport to Medan is doable. It’s crazy cheap but also crazy long. Bus terminal at the airport is located on Level 1. After you exit the gate, turn right. To get to Medan, take Damri bus and alight at Plaza Medan Fair (Carrefour). It costs about IDR 20k. From there, you can get taxi/Grab/Gojek to your hotel. The duration is approximately 1.5 hours to 2 hours, depending on the traffic condition. Uber is no longer around in Southeast Asia, including Indonesia. Instead, there are 2 big ride-sharing companies in Indonesia at the moment: Grab (originally from Malaysia) and Gojek (from Indonesia). It is possible to take Grab/Gojek from airport to Medan and vice versa. If there’s no surcharge, Grab/Gojek is cheaper than taxi and private transfer. It’s a viable option to consider, however, the price may fluctuate due to demand and supply. So, use it at your own risk. Ah, taxi, the familiar sedan that we always know. Taxis run on meter so the final cost depends on the traffic condition (which is often bad in the city). I don’t personally recommend taxi as I trust the above options more, and they all less expensive than taxi. Again, it’s nice to know that in case you are in a rush, you can’t wait for the next train and you can’t get any Grab/Gojek, then you still have taxi as your backup plan. Your inbound flight arrives in Medan late at night and you dread making the long journey to Medan or Lake Toba in the dark. 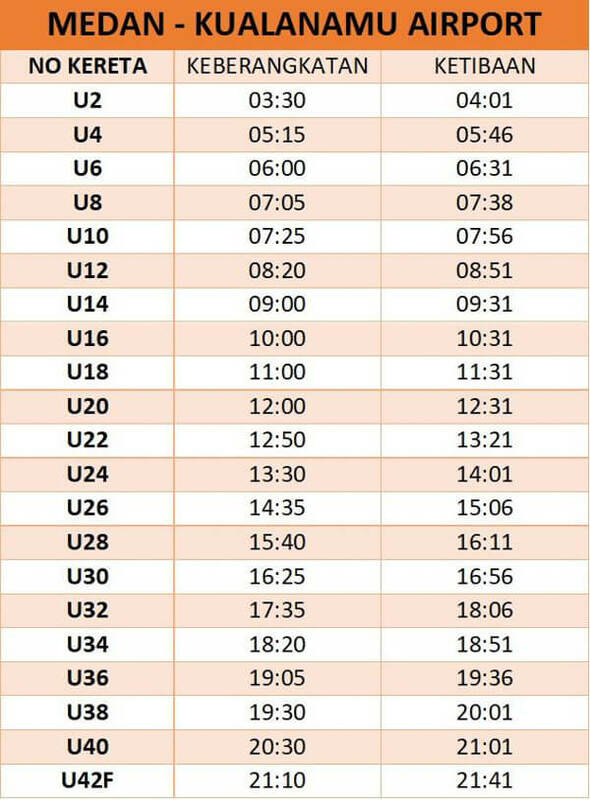 Your outbound flight will be leaving in the morning and you’re unsure if you can make it in time given the horrendous morning traffic in Medan. Consider staying at one of the hotels near airport. 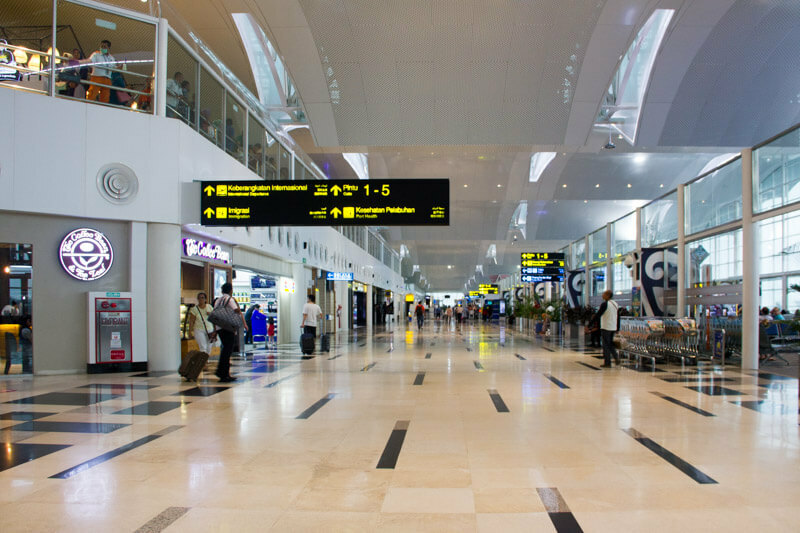 In fact there is 1 hotel right inside the airport and several others within __km from the airport. 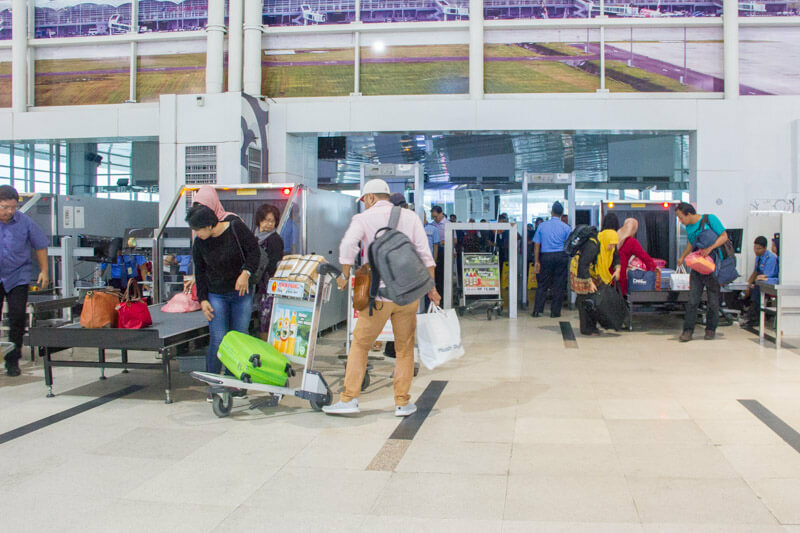 Horison Sky Kualanamu is located at Level 1M of Kualanamu Airport building, so it’s extremely convenient for guests who have inbound late night flight or early morning outbound flight. 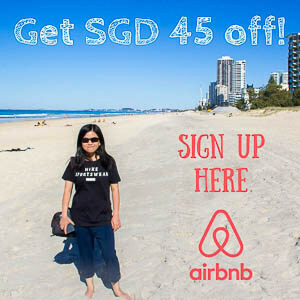 Check latest price on Agoda and Booking. Facilities: 24-hr reception desk, free wifi, buffet breakfast (check the terms&conditions of your hotel booking). 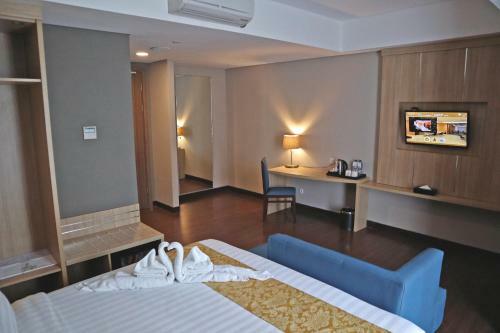 Prime Plaza Hotel is a 4-star hotel located about 7 to 10 mins drive from Kualanamu Airport. If Horison Sky is fully-booked, or if you prefer a hotel with swimming pools, then I recommend Prime Plaza Hotel. 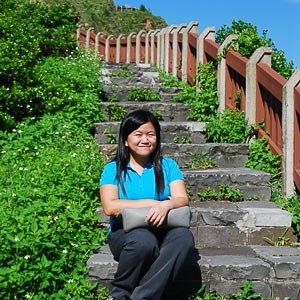 Check latest price on Agoda and Booking. The hotel provides free shuttle to/from airport. If the shuttle timing from the hotel doesn’t suit your flight timing, you can pay extra for private/shared car arrangement. From airport, you can simply get a taxi/Grab/Gojek. There are some restaurants (local food, KFC, coffee place), Magic Eye 3D Art Museum, Hub Market (souvenir/convenience shop) opposite the hotel, but you need to cross the highway (there is a small road to cross under the highway, avoid crossing directly on the highway). 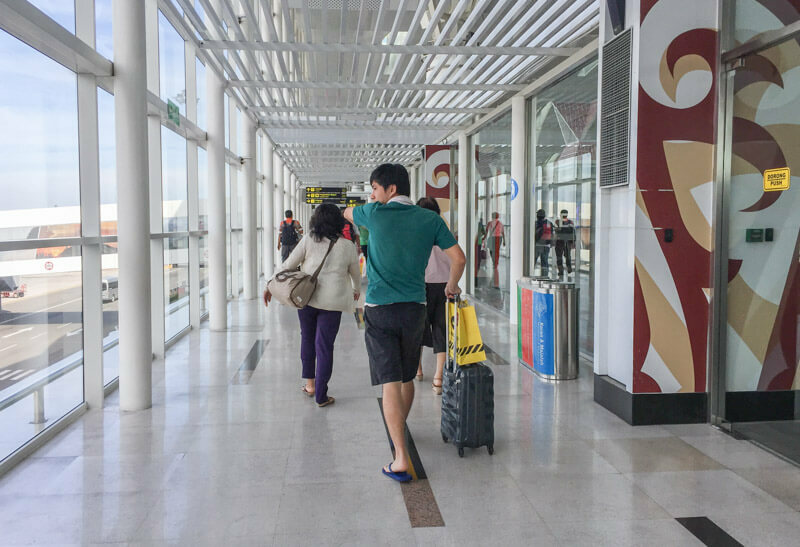 Located opposite Prime Plaza, Wing Hotel is also about 7 to 10 mins drive to the airport. It is a 3-star hotel and it’s cheaper than Horison and Prime Plaza, so it’s a good option for budget travelers. Check latest price on Agoda. There’s a free shuttle to the airport (which needs to be arranged with the hotel in advance), restaurants/coffee shops, Magic Eye 3D Art Museum, Hub Market near the hotel (no need to cross the highway). 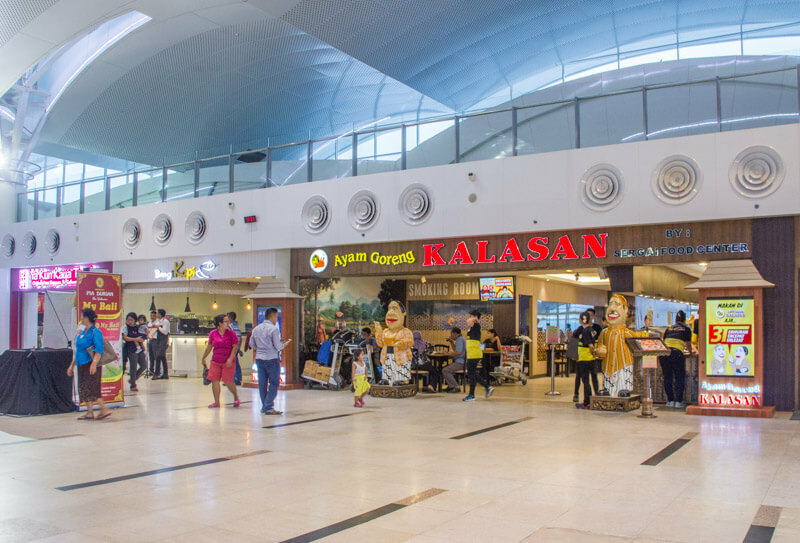 Sapphire Mandai International Lounge is located at International Departure Hall (airside), which is only accessible by passengers flying out of the country. The lounge accepts various local credit cards as well as Priority Pass and LoungeKey. 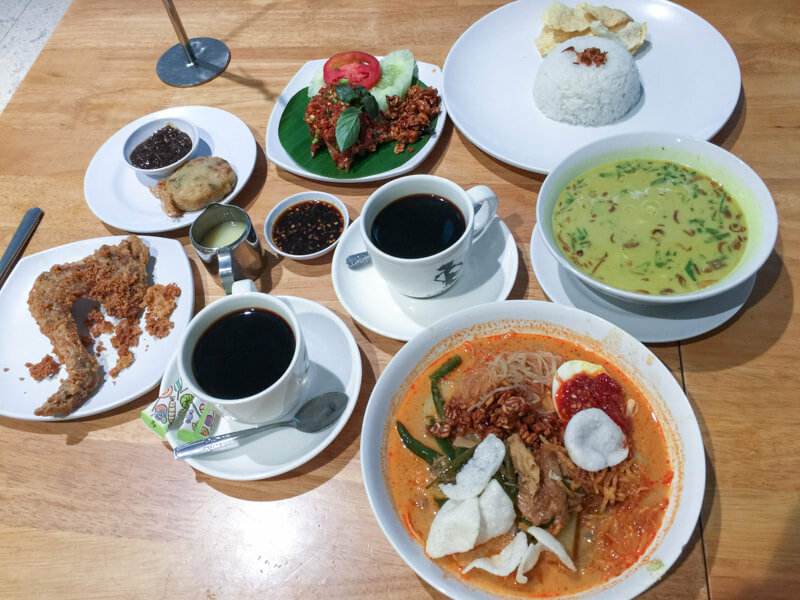 And, they also accept cash payment of IDR 110k per person (as of March 2019)! 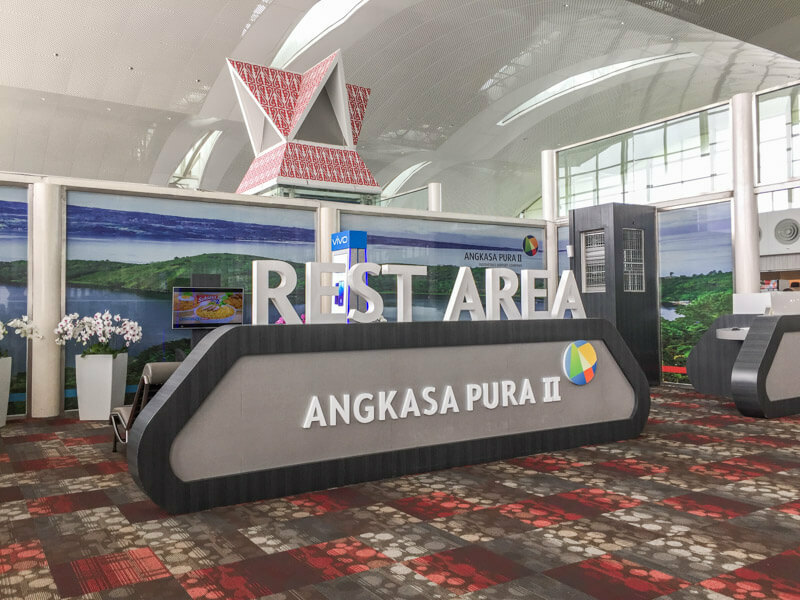 In my opinion, it’s better to pay by cash rather than use Priority Pass because IDR 110k is about one-third of the price that Priority Pass charges you for one visit, well, unless you have unlimited Priority Pass access. 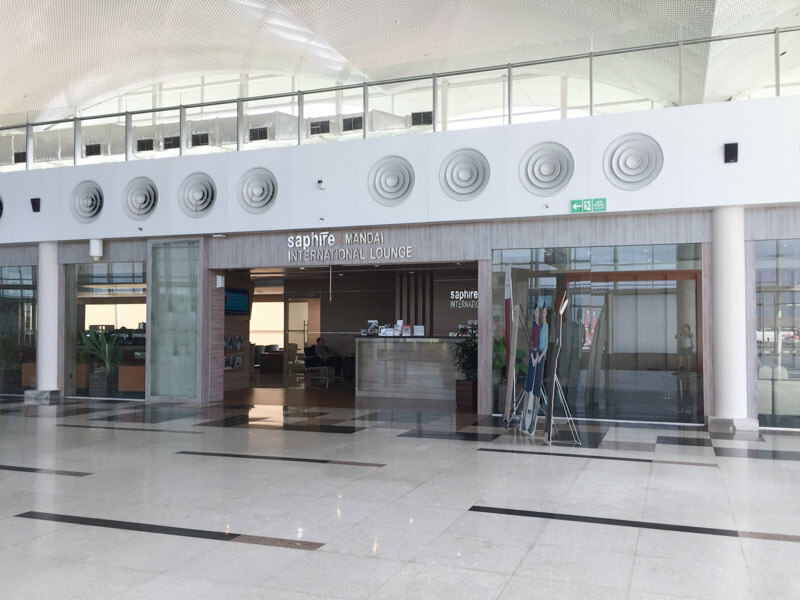 Sapphire Bluesky Premier Lounge is located at the furthest end of Domestic Departure Hall (airside), which is accessible by passengers flying out of the city. 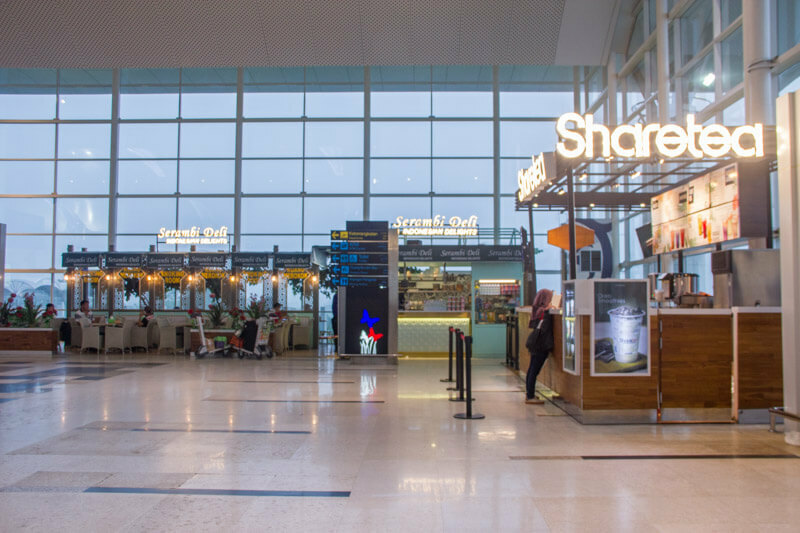 Similar to Sapphire Mandai, this lounge accepts various local credit cards, Priority Pass as well as cash payment of IDR 110k. 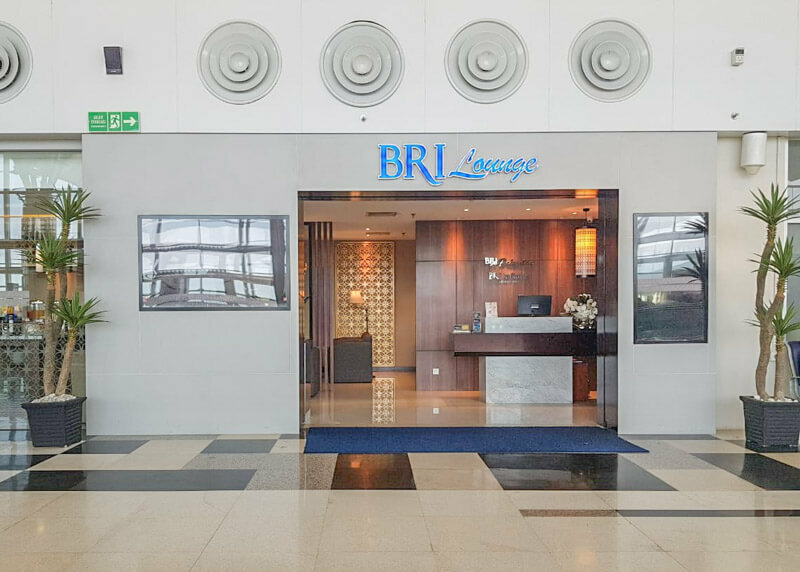 Located at Domestic Departure Hall (airside) beside Sapphire Bluesky, BRI Lounge is less crowded because it only accepts BRI eligible cardholders and JCB. It doesn’t even accept Priority Pass and cash payment! To be honest, there are too many restaurants/cafes in KNO that it’s fruitless to list everything here. And these shops change all the time. So, what I’m going to do is to include just some of the shops here. These shops are all located at Public area. If you want to know the latest list of restaurants, here they are. Do you want to know my favorites? They’re Kalasan and Kok Tong. Similarly, the number of facilities in KNO are too many to list out here. I’m including several important ones here. Do you have any recommendations to include in this article? Do comment below!